trunk-or-treat! car-stume fleet! give us something good to eat! no, no, save your candy for the kids. the treat for us on the car-stume crew every halloween is getting creative to see what we can come up with for each year's respective best of award-winning long-term fleet car — and hopefully bringing you a little automotive amusement in the process. they say the third time's the charm. well, we're quite fond of all of our trunk-or-treat car-stumes over the past three years. still, we can't help but think we hit our spooky stride this year with our frankenstein car costume, and it may just be our finest creation yet. join us as we take a look back on our trunk-or-treat trio. check out the photo galleries below and decide for yourself which was the best halloween car-stume of them all. for our inaugural car-stume three halloweens ago, deciding what our best of 2016 volvo xc90 luxury suv would go as was a no-brainer. 's home city of chicago was in the throes of world series fever as our cubs went on to win it all, led by manager joe maddon. we went a little simpler in 2016 than in subsequent years, focusing on maddon's easily identifiable thick-rimmed eyeglasses, which we constructed from foam board; his baseball cap was a blue umbrella with a cardboard bill and cubbies logo fashioned from paper and stuck on. imagine the spectacle we were when we drove our maddon-mobile right up to the front of wrigley field to shoot photos as the sidewalks teemed with fans. our first time out was a w for all involved. the bar was set for car-stume no. 2. we wanted something that again tapped into a national event or cultural trend, but that also tied back to our windy city hometown. it just so happened that 2017 turned out to be the year of the creepy clown, with widespread reports of suspects walking around residential neighborhoods at night in full bozo regalia and scaring children silly. that phenomenon happened to coincide with the massive success of the big-screen version of stephen king's "it," famously featuring pennywise the killer clown. well, in chicago, we lay claim to a killer clown of our own in heath ledger's iconic joker from "the dark knight," filmed right here on the streets of downtown chicago. so we got ourselves white automotive wrap to simulate the clown prince of crime's pasty pallor, black and red wrap for his dark eyes and red mouth, green construction paper cut into long strips and affixed to the roof for his hair, and a large blanket of purple fabric bearing ledger's joker's signature catchphrase, "why so serious?" we again were quite a sight when we drove our joker car to real locations from "the dark knight," including south lasalle street in the financial district and chicago's sub-street system on lower wacker drive. 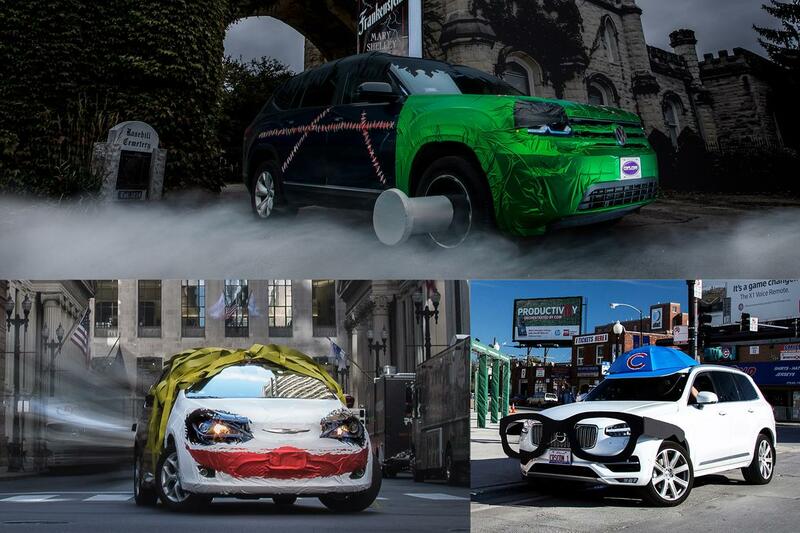 our car-stume may have been the joker, but we weren't kidding around. for car-stume no. 3, we took our inspiration from mary shelley's "frankenstein; or, the modern prometheus." the author may have had trouble settling on a title, but it wasn't difficult for us to settle on this halloween-friendly theme, what with 2018 being the 200th anniversary of shelley's classic horror novel and all. we didn't have a chicago tie-in this year, though the city has an abundance of gothic-looking architecture and subject-appropriate locations for photo shoots; we took our franken-car to downtown's harold washington library on south state street and rosehill cemetery on the city's north side. we brought frankenstein's monster to life using a green vinyl car wrap for the face, red and white wrap for the scars and stitches, black wrap for the eyebrows and black fabric for the hair, plus painted styrofoam and cardboard for the "neck" bolts we affixed to the front wheels with pop cans. with apologies to our flat-headed friend — "fire, bad!" after all — but this year's car-stume ... is fire.